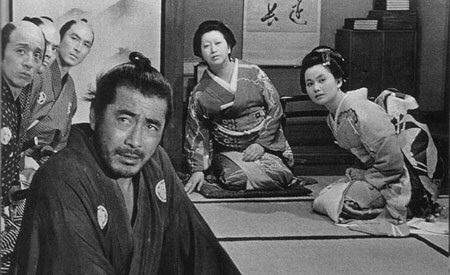 Toshiro Mifune (the scruffy-looking guy) is the eponymous ronin of Sanjuro. The Skinny: This reviewer’s all-time favorite Japanese film is still a joy to watch some forty-seven years after its theatrical release. Toshiro Mifune reprises his most famous role in this sequel to Akira Kurosawa’s Yojimbo. Less bleak than its predecessor, Sanjuro shines in large part due to its tightly-paced plot, a winning sense of humor, and some brilliant samurai action. It also possesses quite possibly the greatest samurai duel in cinema history. Akira Kurosawa’s 1961 film Yojimbo proved so popular that when he tried to adapt Shugoro Yamamoto’s novel Peaceful Days, Toho execs convinced him to retool the story into a direct sequel to his earlier hit. The resulting film was 1962’s Sanjuro, an underrated gem in Kurosawa’s already treasure-filled filmography. This rollicking follow-up to its bleaker predecessor combines equal parts humor and action, all in the space of a taut one hour and thirty-six minutes. With a brilliant acting turn by Toshiro Mifune, it’s a film that’s on par with Kurosawa’s more well-known works and, in my estimation, a classic in its own right. The film opens with a clandestine gathering of nine men, who believe that a shadowy conspiracy of internal corruption is gripping the clan. Izaka (Yuzo Kayama), who quickly emerges in this meeting as the leader of this small band of do-gooders, reveals to his brethren that Mutsuta (Yunosuke Ito), the horse-faced Chamberlain and Izaka’s own uncle, may be the one pulling the strings. When the Chamberlain explicitly forbids him from investigating the matter any further, the impulsive Izaka consults the superintendent of the clan, Kikui (Masao Shimizu), for support. Handsome and receptive, Kikui says that he will take prompt action to uncover the truth - while also inquiring about the location where Izaka and his buddies will be meeting to discuss these matters. Upon hearing this, the eight other samurai rejoice, as they all believe they have a righteous, justice-loving superintendent. But their dreams are shattered when a scruffy-looking ronin (Toshiro Mifune) emerges from the shadows to offer some sage advice. With a delightfully mordant wit and razor-sharp intelligence, this wandering, presumably masterless samurai (who will later identify himself as “Tsubaki Sanjuro”) proceeds to demolish their half-baked theory, demonstrating that it’s not the Chamberlain that the boys should be worried about, but the man they’ve valorized based primarily on looks: the superintendent, Kikui. The nine men are skeptical, but Sanjuro turns out to be on the money when a gathering of forces emerges from the woods to surround their secret meeting place. With the young men facing certain death, Sanjuro decides to intervene on their behalf. Using some fancy verbal trickery and some even fancier swordplay, Sanjuro handily fends off these would-be assassins. His obvious toughness and physical courage during the melee earns the respect of Kikui’s chief henchman, the skilled swordsman Hanbei Muroto (Tatsuya Nakadai), who offers him a job with the clan. Sanjuro declines despite seeming open to the proposition. This meeting will prove to be the lynchpin for all events that follow, and as the film develops, Muroto will be revealed as Sanjuro’s dark double and a formidable foe. When Kikui’s lackeys take off, Sanjuro decides that he can’t yet part ways with these nine men, though he has no personal stake in the matter. These boys may have good intentions, but Sanjuro also sees how their adherence to conventional ideas about heroism - not to mention their propensity towards rash action - is sure to get them and others killed. Some of the men don’t know whether they can trust Sanjuro – his manners, his ideas, and his very attitude seem completely at odds with what they think a samurai should be – but they eventually begin to understand that he’s infinitely wiser (and stronger) than even the nine of them combined. And so, Sanjuro becomes the group’s chief strategist and de facto secret weapon in their quest to outsmart Muroto’s men and rescue the Chamberlain and his immediate family (amusingly played by Takako Irie and Reiko Dan) from certain harm. While it’s no secret that Sanjuro is one of my all-time favorite films (I even went so far as to use it as my LoveHKFilm.com pseudonym), I’m not above re-examining a film upon later viewings - and I was not disappointed in revisiting this one. What was really striking to me this time around was how – aside from Kurosawa’s occasional use of wipes to transition from scene-to-scene – the film felt so modern and well-paced. Part of this has to do with the script, but even from a technical standpoint, one can see how even Kurosawa’s framing of the mise-en-scene is visually inventive and arresting, belying modern assumptions about how boring “old movies” look and feel. Another element that enlivens the proceedings is the score. Masaru Sato (composer for Yojimbo, The Hidden Fortress, and Throne of Blood) outdoes himself with a bombastic soundtrack that can sound triumphant or just plain goofy depending on Kurosawa’s need to enhance or undercut onscreen actions. But aside from the script, the visuals, and the music, the main reason for the success is undoubtedly its leading man. Able to appear at once weary, grizzled, and feral as a wild beast, Toshiro Mifune delivers a revelatory performance. In addition, the man’s swordplay is amazing, not necessarily in terms of technical skill, but in the way in which he throws himself into those scenes with wild abandonment. In one particular scene, Sanjuro cuts down a number of foes in quick succession, and the sheer frenzy of it all, not to mention the character’s anger about having to kill others, is palpably felt. In the aftermath of said scene, Sanjuro slaps three of the young samurai for forcing him into a situation in which violence was the only option. One can clearly see that Mifune strikes the actors full-on, knocking them for a loop. Their shocked reactions are undeniably real. Although just a small example, this is the level of verisimilitude that Mifune brings to the proceedings. But what makes Sanjuro more entertaining than its more famous predecessor is pitch-perfect tonal shifts. The film successfully fluctuates from moments of light humor to pace-quickening action, all the while throwing in some serious philosophical reflection without losing a step. Full of funny lines and humorous situation, Sanjuro also contains one of the most amusing cases of Stockholm Syndrome ever put to film, as one of Muroto’s men is taken prisoner by Sanjuro, only to identify, advise, and even celebrate with his captors to much comic effect. Notes:  The source material for this film, the novel Peaceful Days, was eventually adapted as director Kihachi Akamoto’s Kill! (1968) starring Tatsuya Nakadai.  Tsubaki means “camellia.” In both films, Sanjuro improvises a surname based on whatever plant life is nearby. For the record, his alias in Yojimbo is Kuwabatake (“mulberry field”).  The unforgettably explosive conclusion was actually an accident on the part of a nervous crewman, eager to please Kurosawa. The man was fearful that he’d ruined the shot, but the happy accident pleased Kurosawa so much that he kept the scene in the film.